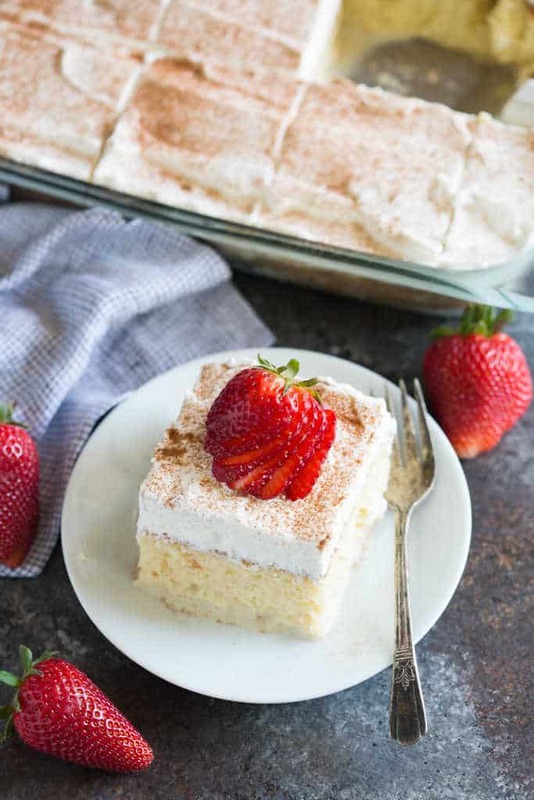 The BEST authentic homemade Tres Leches Cake. An ultra light cake soaked in a sweet milk mixture and topped with fresh whipped cream and cinnamon. This simple Mexican dessert is one of our favorites! 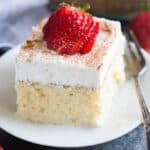 Tres leches literally means, “three milks” and tres leches cake is an ultra light sponge cake soaked in a sweet milk mixture. 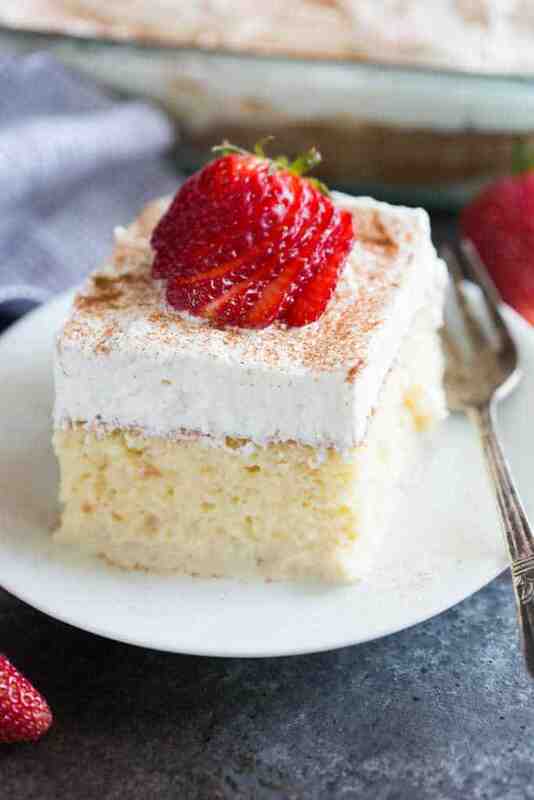 Tres leches cake is a popular cake in Mexico and Latin America. It really wouldn’t be a Cinco de Mayo celebration this easy cake recipe! The cake is similar to an angel food cake. The whipped egg whites in the batter make it extra light and spongy. 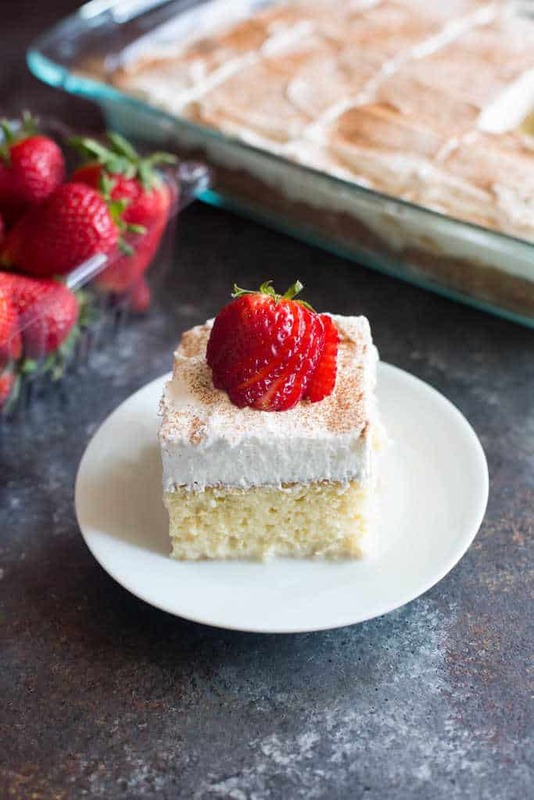 After baking the cake you poke holes in it with a fork and pour three types of milk over the top–evaporated milk, sweetened condensed milk, and whole milk–hence the name “tres leches”. Start by combining flour, baking powder and salt in a large bowl. Separate the eggs and add sugar to the egg yolks. Mix well and add milk and vanilla to the same bowl. Pour the egg yolk mixture over the flour mixture and stir to combine. Beat the egg whites in a separate bowl, add sugar and beat to stiff peaks. Fold the egg whites into the batter and fold in to combine. Smooth the mixture into your 9×13 pan and bake for 25-30 minutes. In the meantime, combine the three types of milk in a small bowl. Once the cake is cooled, poke holes all over the top and slowly pour the milk mixture over top. 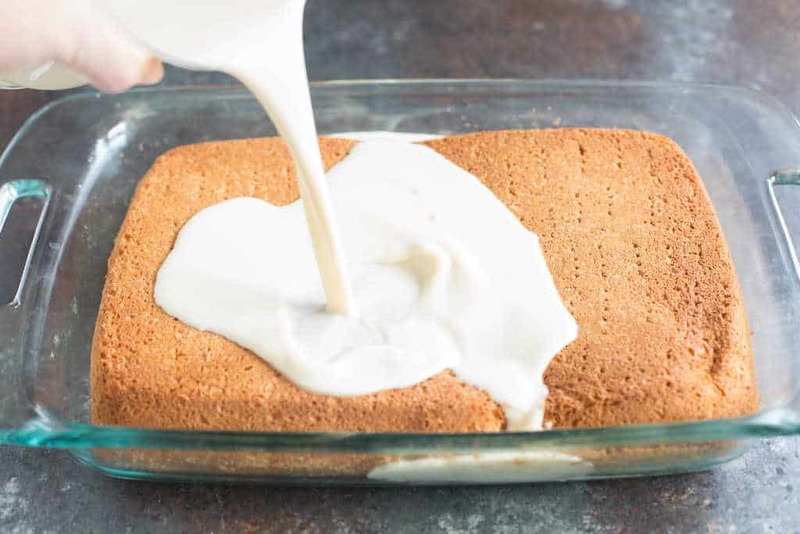 Refrigerate the Tres leches cake for at least 1 hour or overnight to allow it to soak up the milk. Spread sweetened whipped cream all over the top and finish it off with a sprinkle of cinnamon, and some fresh sliced strawberries if you want. It’s DIVINE. One of the easiest cakes to make and it’s always, always a crowd pleaser! Store Tres Leches Cake in the refrigerator after coving it with plastic wrap or a secure lid. It’s best to store this cake for several hours or overnight before serving so that the cake has a chance to soak up the milk mixture. If you have leftovers, they can be stored in the fridge for up to 3 days. Can you make Tres Leches Cake ahead of time? Yes, you can make Tres leches cake 1-2 days in advance. In fact, I love to make this cake the night before so that the cake has a chance to soak up some of the milk that was poured over top. You can store it with whipped cream on top as well or wait to top it with whipped cream before serving. 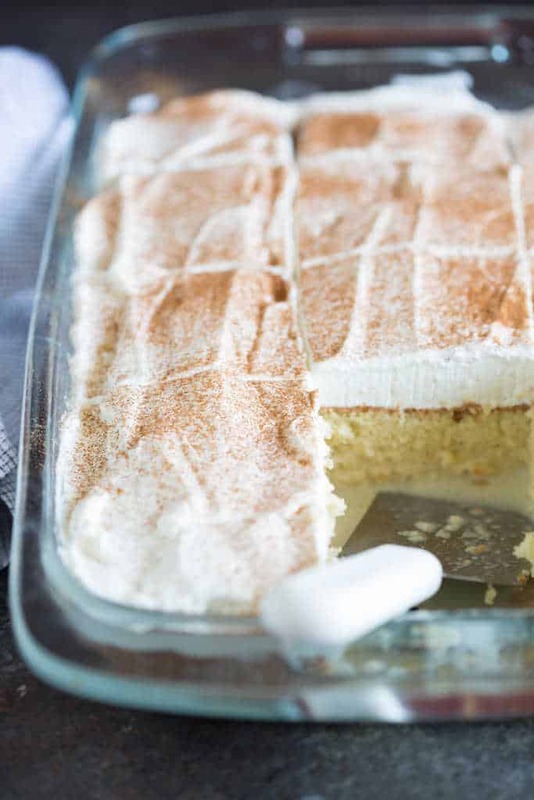 Is Tres Leches Cake made with oil or butter? This tres leches cake is NOT made with butter or oil. And trust me, you won’t notice or miss those ingredients! The BEST authentic Tres Leches Cake. An ultra light cake soaked in a sweet milk mixture and topped with fresh whipped cream and cinnamon. This simple Mexican dessert is one of our favorites! Preheat oven to 350 degrees F. Lightly spray a 9x13'' pan with non-stick cooking spray. In a medium bowl combine flour, baking powder, and salt in a large bowl. Separate the eggs into two separate bowls. Add 3/4 cup sugar to the bowl with the egg yolks and mix on high speed until yolks are pale yellow. Add the 1/3 cup milk and vanilla and stir to combine. Pour the egg yolk mixture over the flour mixture and stir gently just until combined (don't over-mix). Use electric beaters to beat the egg whites on high speed. Gradually add the remaining 1/4 cup of sugar as you mix and continue beating until stiff peaks. Fold egg whites into the batter gently, just until combined. Pour batter into prepared pan. Make sure to smooth it into an even layer so your baked cake doesn't have divots in it. Bake for 25 to 35 minutes, or until a toothpick inserted in the center of the cake comes out clean. Remove from the oven and allow cake to cool completely. Combine the evaporated milk, sweetened condensed milk, and whole milk in a small bowl. Once the cake has cooled use a fork to poke holes all over the top of the cake. Slowly pour the milk mixture over the the top of the cake, making sure to pour near the edges and all around. Refrigerate the cake for at least 1 hour or overnight, to allow it to soak up the milk. In the meantime, whip the heavy cream, sugar and vanilla until stiff peaks. Smooth over the top of the cake. Sprinkle cinnamon on top. Serve with fresh sliced strawberries, if desired. Enjoy! Serve with one of my authentic Mexican recipes! This post was originally shared in May 2015 but I’ve updated and revamped it to include new photos! I need to make a dessert for a lot of people. Can this recipe be doubled? Also can it be made ahead and froze? Hi Laura–I have not experimented with freezing this. If it were me, I’d probably freeze the cake before adding the milks. Then add the milks and let it come to room temperature in the fridge for at least a day. You will need 1 and 1/2 teaspoons of baking powder. Hi, I need help please. For the topping, do I wait until I serve to put on? Thank you. No you can put it on several hours in advance, or even the night before.